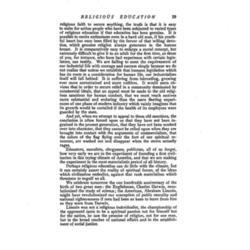 For thousands of years religious education has meant to the mass of men definite instruction given by authorized agents to young people at the age of thirteen. 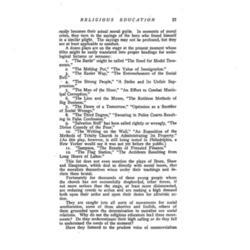 We are all familiar with the historic illustrations and need but mention the tribal ceremonials, the assumption of the Roman toga, the [Bar mitzvah] of the Jews, the First Communion of thousands of children in Catholic Europe, the Sunday schools of even the least formal evangelical sects. It is as if men had always felt that this expanding period of human life must be seized upon for spiritual ends, that the tender tissue and newly awakened emotion must be made the repository for the historic ideals and dogmas which are, after all, the most precious possessions of the race. 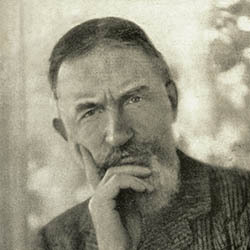 How serious the indictment, then, which might be brought against a generation of moralists, educators, publicists and clergyman who had neglected this duty and had even failed to keep the young committed to their charge unspotted from the world, who had indeed turned over to the world ruthless and materialistic as it is at the present moment, thousands of children in every great city who are obliged either to work out for themselves, as best they may, an actual code of morals, or to get on with none at all. And yet those of us who live in Chicago are obliged to confess that last year there were arrested and brought into court fifteen thousand young people under the age of twenty who had failed to keep even the common law of the land. It is said, indeed, that practically the whole machinery here of that grand jury and the criminal court is maintained and operated for the benefit of youths between the ages of thirteen and twenty-three. Men up to ninety years of age commit crimes, but they are not characterized by the recklessness, the bravado and horror which have stained our records in Chicago. An adult with the most sordid experience of life and the most rudimentary notion of prudence, could not possibly have committed them. Only a utilization of that sudden burst of energy belonging partly to the future, could have achieved them. Only a capture of the imagination and the deepest emotions of youth by what men all religion could have prevented them. And yet these fifteen thousand children had all been subjected to some sort of religious instruction. 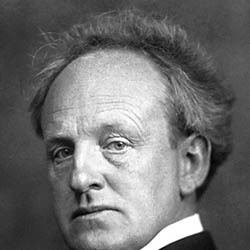 It had failed, either because it had been perfunctory in its nature and did not result in any psychic compulsion at all, or because it was too detached from life, their teachers forgetting that the young are ever impatient of creeds which do not inspire them to conduct, and [page 2] that it must be grand, vague, and noble conduct at that. 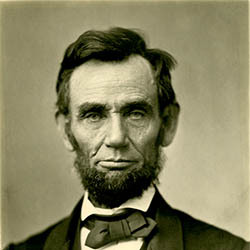 Of Lincoln's enlistment of two and a half-million soldiers, two million were under the age of twenty-one, one million under the age of eighteen, and one hundred thousand under fifteen. Even in those stirring times when patriotism and high resolve were at the flood, no one responded as "the boys" did, and the great soul who yearned over them, who refused to shoot the sentinels who slept the sleep of childhood, knew as no one else knew, the precious glowing stuff out of which his army was made. 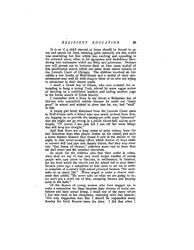 But what of the millions of boys who are now searching for adventurous action, longing to fulfill the same sort of high purpose? It is as if we ignored a wistful, over-confident creature who walked through our city streets calling out, "I am the spirit of Youth, with me all things are possible." We fail to understand what he wants or even to see his doings although his acts are pregnant with meaning and we may either translate them into a sordid chronicle of petty crimes or turn them into a solemn school for civic righteousness. We may either feed the divine fire of youth or we may smother it. We may tend it into a lambent flame with power to make clean and bright our dingy towns, or we may stand stockstill, stupidly staring at the murky fire of crime. 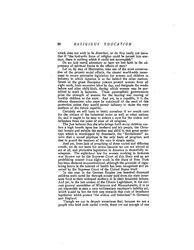 It is as if a child starved at home should be forced to go out and search for food, selecting quite naturally not that which was nourishing but that which was exciting and appealing to his outward sense, often in his ignorance and foolishness blundering into substances which are filthy and poisonous. 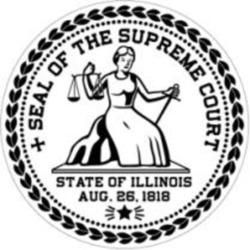 Perhaps you will permit me to instance three or four cases typical of this misdirected search which are taken from recent records of the Juvenile Court of Chicago. 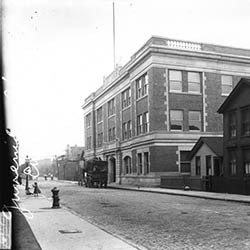 The children involved all live within a few blocks of Hull-House and a recital of their misadventures may well fill with chagrin those of us who are trying to administer to their deeper needs. I recall a Greek boy of fifteen, who was arrested for attempting to hang a young Turk, stirred by some vague notion of carrying on a traditional warfare and adding another page to the heroic annals of Greek history. I remember with a lump in my throat a Bohemian boy of thirteen who committed suicide because he could not "make good" in school and wished to show that he, too, had "stuff" in him. 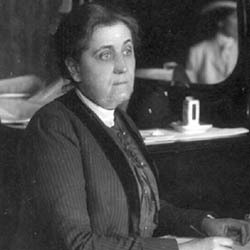 A young girl lately dismissed from the Juvenile Court came to Hull-House with a friend who was newly arrived from Russia, begging us to provide the immigrant with some "pleasures" that she might not go wrong in a public dance-hall, saying quite simply, "Of course I am bad, but I can tell her some things that will keep her straight." And then there are a long series of petty crimes, from the two American boys who played Indian on the wharf, and stole a horse blanket because they found it cold in the middle of the night, to that never-ceasing effort which dozens of boys make to convert dull lead pipe into theater tickets, that they may enter into "that house of dreams," infinitely more real to them then the dull street and the crowded tenements. So much for the children who find their outlet in crime, what shall we say of that very much larger number of young people who cast about in libraries, in settlements, in theaters, for the food which the church and the school fail to give them? Several years ago a committee of lads came to see me in order to complain of a certain high-school principal because "He never talks to us about life." When urged to make a clearer statement they added, "He never asks us what we are going to be; we can't get a word out of him, expecting lessons and keeping quiet in the halls." "His only suggestion was that I should be responsible every Sunday for fresh flowers upon the altar. 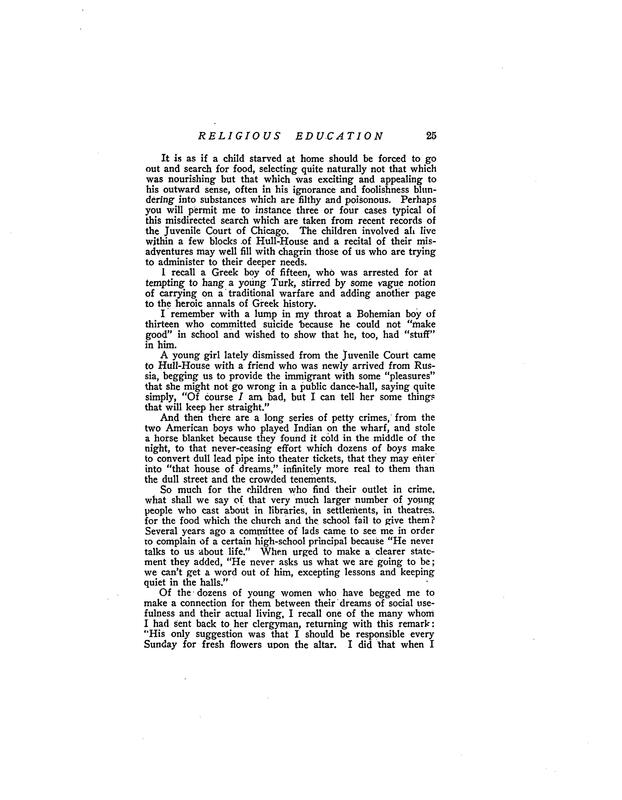 I did that when I [page 4] was fifteen and liked it then, but when you have come back from college and are twenty-two years old, it doesn't seem to quite fit in with the vigorous efforts you have been told are necessary in order to make our social relations more Christian." That old desire to achieve, to capture the world, seizes the ardent youth of today with a stern command to bring about juster social conditions. They are impatient "with the rose water for the plague" prescriptions, and insist upon something more strenuous and vital. 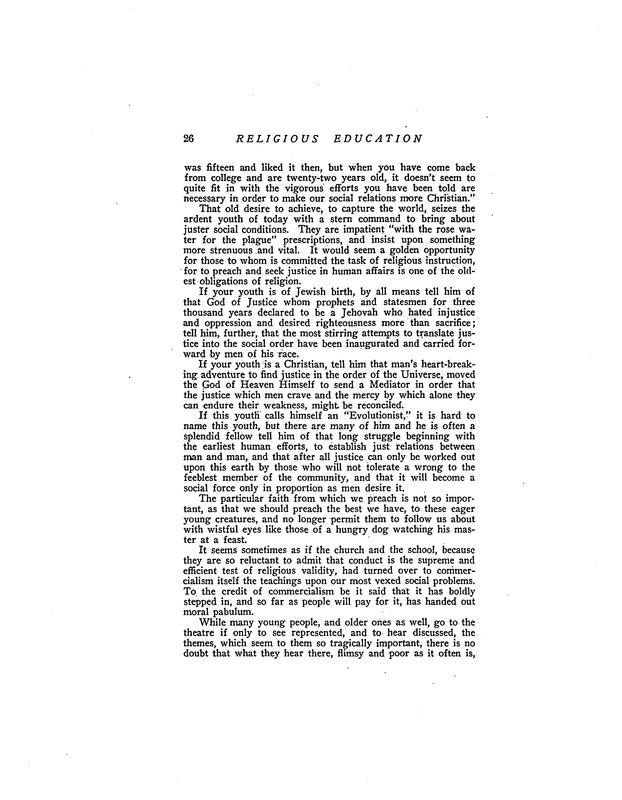 It would seem a golden opportunity for those to whom is committed the task of religious instruction, for to preach and seek justice in human affairs is one of the oldest obligations of religion. If your youth is of Jewish birth, by all means tell him of that God of Justice whom prophets and statesmen for three thousand years declared to be a Jehovah who hated injustice and oppression and desired righteousness more than sacrifice; tell him, further, that the most stirring attempts to translate justice into the social order have been inaugurated and carried forward by men of his race. If your youth is a Christian, tell him that man's heart-breaking adventure to find justice in the order of the Universe, moved the God of Heaven Himself to send a Mediator in order that the justice which men crave and the mercy by which alone they can endure their weakness, might be reconciled. 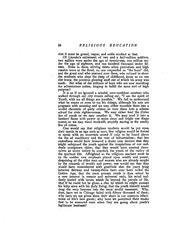 If this youth calls himself an "Evolutionist," it is hard to name this youth, but there are many of him and he is often a splendid fellow tell him of that long struggle beginning with the earliest human efforts, to establish just relations between man and man, and that after all justice can only be worked out upon this earth by those who will not tolerate a wrong to the feeblest member of the community, and that it will become a social force only in proportion as men desire it. The particular faith from which we preach is not so important, as that we should preach the best we have, to these eager young creatures, and no longer permit them to follow us about with wistful eyes like those of a hungry dog watching his master at a feast. It seems sometimes as if the church and the school, because they are so reluctant to admit that conduct is the supreme and efficient test of religious validity, had turned over the commercialism itself the teachings upon our most vexed social problems. To the credit of commercialism be it said that it had boldly stepped in, and so far as people will pay for it, has handed out moral pabulum. While many young people, and older ones as well, go, to the theatre if only to see represented, and to hear discussed, the themes, which seem to them so tragically important, there is no doubt that what they hear there, flimsy and poor as it often is, [page 5] easily becomes their actual moral guide. In moments of moral crisis, they turn to the sayings of the hero who found himself in a similar plight. The sayings may not be profound, but they are at least applicable to conduct. "The Battle" might be called "The Need for Model Tenements." "The Melting Pot," "The Value of Immigration." "The Easier Way," "The Entrenchments of the Social Evil." "The Strong People," "A Strike and Its Unfair Suppression." "The Man of the Hour," "An Effort to Combat Municipal Corruption,"
"The Lion and the Mouse," "The Ruthless Methods of Big Business." 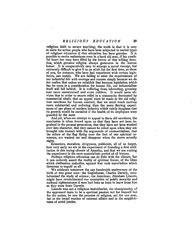 "The Dawn of a Tomorrow," "Optimism as a Rectifier of Social Wrongs." "The Third Degree," "Sweating in Police Courts Resulting in False Confession." "Salvation Nell" has been called rightly or wrongly, "The Divine Comedy of the Poor." "Sampson," "The Results of Frenzied Finance." "The Flag Station," "The Accidents Resulting from Long House of Labor." This list does not even mention the plays of Ibsen, Shaw, and Hauptman, which deal so directly with moral issues, that the moralists themselves wince under their teachings and declare them brutal. 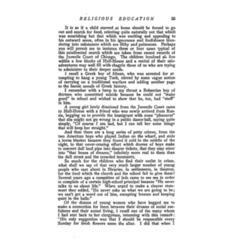 Fortunately for thousands of these young people whom the church has not successfully shepherded, other forces, if not more serious than the stage, at least more disinterested, are reducing creeds to action and are making a high demand both upon their ardor and upon their desire for altruistic action. They are caught into all sorts of movements for social amelioration, some of them abortive and foolish, others of them grounded upon the determination to moralize our social relations. 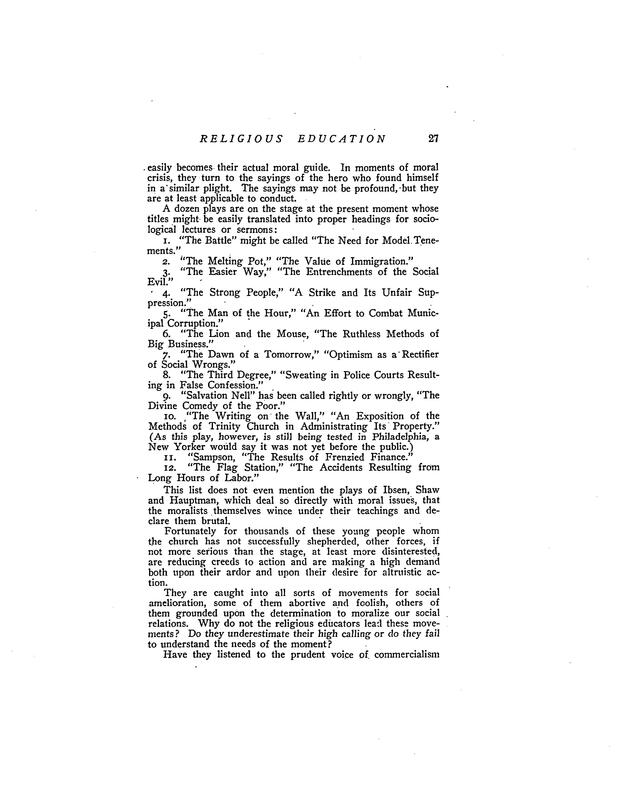 Why do not the religious educators lead these movements? Do they underestimate their high calling or do they fail to understand the needs of the moment? 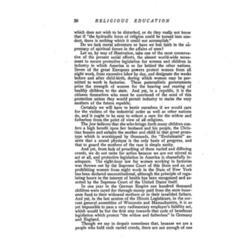 Have they listened to the to the prudent voice of commercialism [page 6] which does not wish to be disturbed, or do they really not know that if "the hydraulic force of religion could be turned into conduct, there is nothing which it could not accomplish." Do we lack moral adventure or have we lost faith in the supremacy of spiritual forces in the affairs of men? Let us, by way of illustration, take one of the most conservative of the present social efforts, the almost world-wide movement to secure protective legislation for women and children in industry in which America is so far behind the other nations. Seven of the great European powers protect women from all night work, from excessive labor by day, and designate the weeks before and after child-birth, during which women may be permitted to work in factories. These paternalistic governments prize the strength of women for the bearing and rearing of healthy children to the state. And yet, in a republic, it is the citizens themselves who must be convinced of the need of this protection unless they would permit industry to maim the very mother of the future republic. Certainly we will have to bestir ourselves if we would care for the victims of the industrial order as well as other nations do, and it ought to be easy to exhort a care for the widow and fatherless from the point of view of all religions. 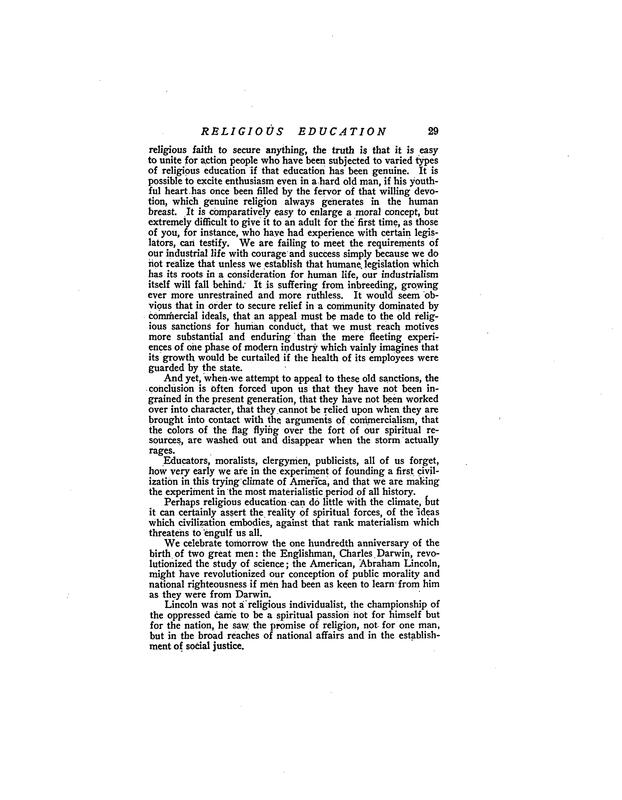 The Jew believes that she who brings forth many children confers a high benefit upon her husband and his people, the Christian honors and exhalts the mother and child in that great prototype which is worshipped by thousands, the "Evolutionist" asserts that a sound physique is the only basis of progress, and that to guard the mothers of the race is simple sanity. 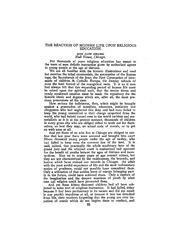 And yet, from lack of preaching of these varied and differing creeds, we do not unite for action because we are not stirred to act at all, and protective legislation in America is shamefully inadequate. 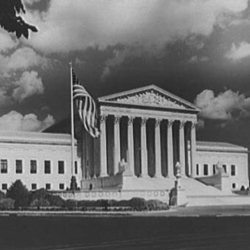 The eight-hour law for women working in factories was thrown out by the Supreme Court of this State and an act prohibiting women from night work in the State of New York has been declared unconstitutional, although the principle of regulating hours in the interest of health has been recognized and asserted by the Supreme Court of the United States itself. In one year in the German Empire one hundred thousand children were cared for through money paid from the state insurance fund to their widowed mothers or to their invalided fathers. 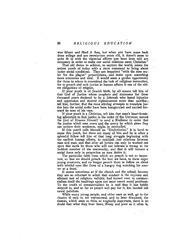 And yet, in the last session of the Illinois Legislature, in the current general assemblies of Wisconsin and Massachusetts, it is as yet impossible to pass a very rudimentary employer's liability act, which would be but the first step towards that code of beneficent legislation which protect "the widow and fatherless" in Germany and England. 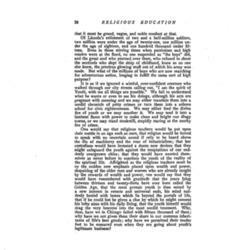 Though we say in despair sometimes that, because we are a people who hold such varied creeds, there are not enough of one [page 7] religious faith to secure anything, the truth is that it is easy to unite for action people who have been subjected to varied types of religious education if that education has been genuine. It is possible to excite enthusiasm even in a hard old man, if his youthful heart has once been filled by the fervor of that willing devotion, which genuine religion always generates in the human breast. It is comparatively easy to enlarge a moral concept, but extremely difficult to give it to an adult for the first time, as those of you, for instance, who have had experience with certain legislators, can testify. We are failing to meet the requirements of our industrial life with courage and success simply because we do not realize that unless we establish that humane legislation which has its roots in a consideration for human life, our industrialism itself will fall behind. It is suffering from inbreeding, growing ever more unrestrained and more ruthless. 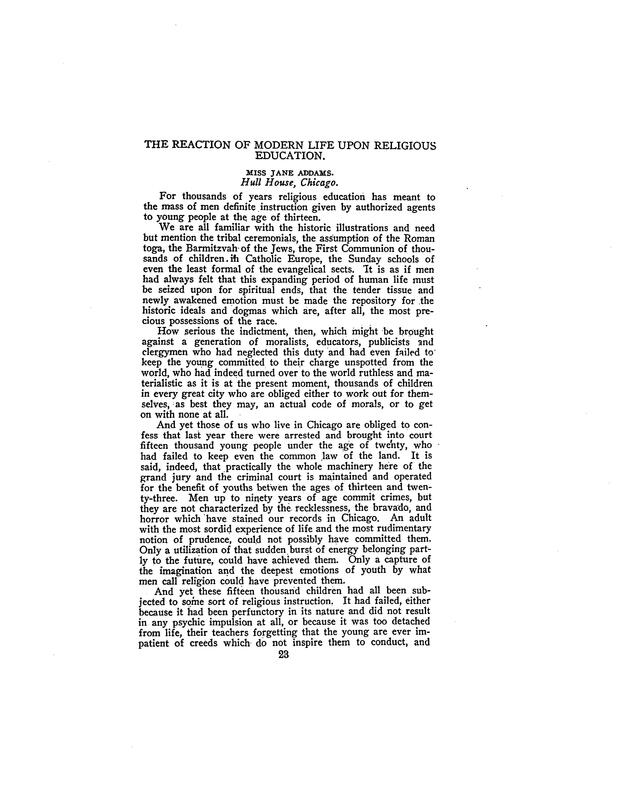 It would seem obvious that in order to secure relief in a community dominated by commercial ideals, that an appeal must be made to the old religious sanctions for human conduct, that we must reach motives more substantial and enduring that the mere fleeting experiences of one phase of modern industry which vainly imagines that its growth would be curtailed if the health of its employees were guarded by the state. And yet, when we attempt to appeal to these old sanctions, the conclusion is often forced upon us that they have not been ingrained in the present generation, that they have not been worked over into character, that they cannot be relied upon when they are brought into contact with the arguments of commercialism, that the colors of the flag flying over the fort of our spiritual resources, are washed out and disappear when the storm actually rages. 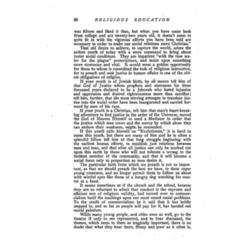 Educators, moralists, clergymen, publicists, all of us forget, how very early we are in the experiment of founding a first civilization in this trying climate of America, and that we are making the experiment in the most materialistic period of all history. 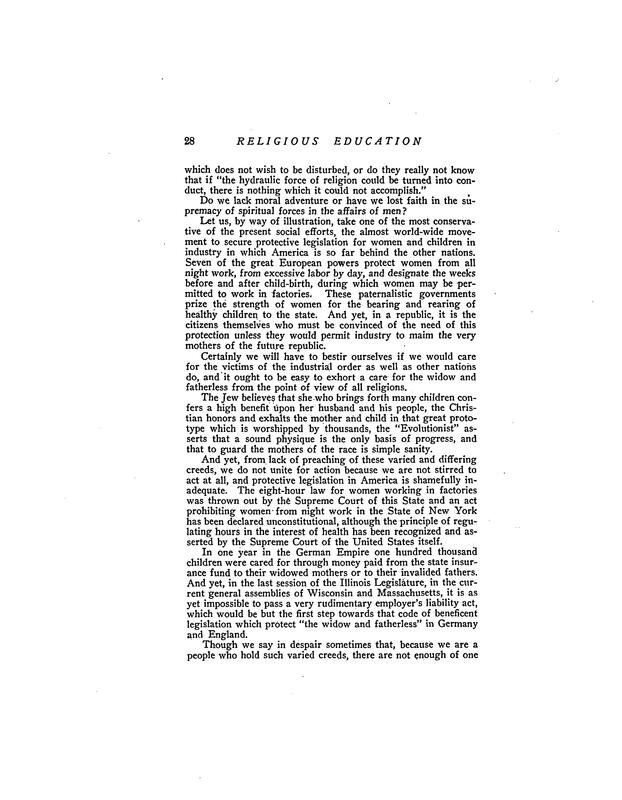 Perhaps religious education can do little with the climate, but it can certainly assert the reality of spiritual forces, of the ideas which civilization embodies, against that rank materialism which threatens the engulf us all. 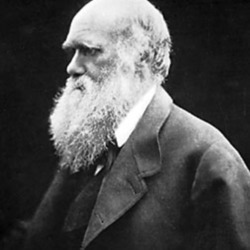 We celebrate tomorrow the one hundredth anniversary of the birth of two great men: the Englishman, Charles Darwin, revolutionized the study of science; the American, Abraham Lincoln, might have revolutionized our conception of public morality and national righteousness if men had been as keen to learn from him as they were from Darwin. Lincoln was not a religious individualist, the championship of the oppressed came to be a spiritual passion not for himself but for the nation, he saw the promise of religion, not for one man, but in the broad reaches of national affairs and in the establishment of social justice. 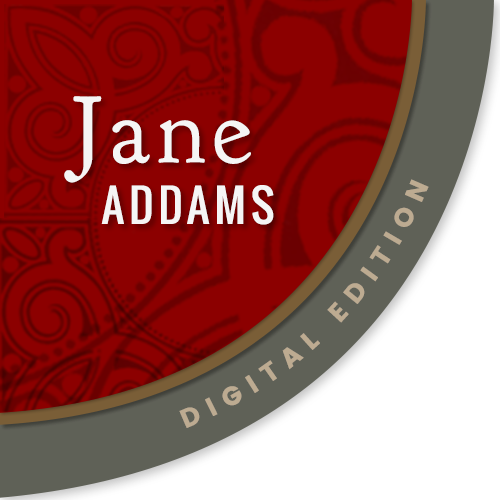 Addams explains the relationship between education, religion, labor, and crime as she has experienced it in Chicago. 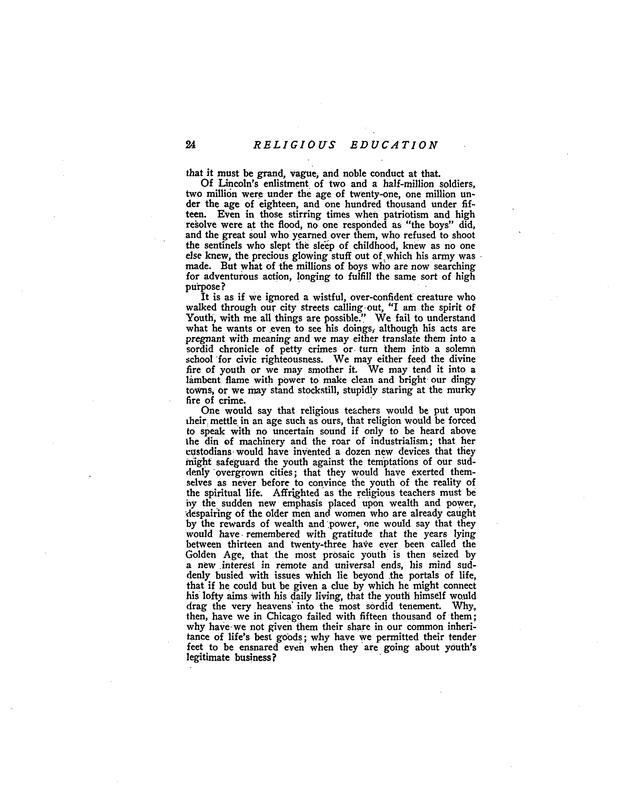 The Reaction of Modern Life upon Religious Education. 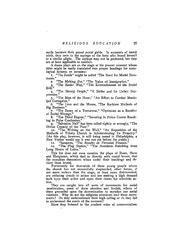 Religious Education 4 (1909 Apr-1910 Feb): 23-29. 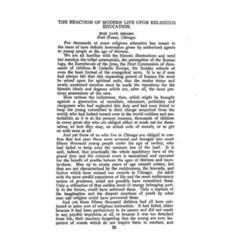 Addams, Jane, “The Reaction of Modern Life upon Religious Education, February 11, 1910,” Jane Addams Digital Edition, accessed April 25, 2019, https://digital.janeaddams.ramapo.edu/items/show/4957.